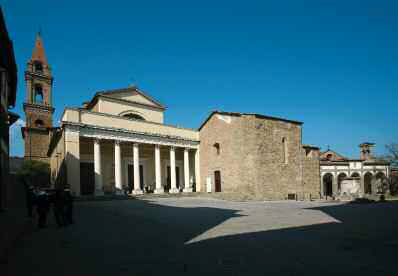 The Collegiate Church of San Giuliano is located at the beginning of a complex of religious buildings that testify to the continuity over time of this religious area. 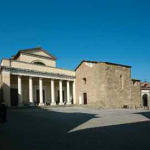 Thus, in addition to the collegiate church, the Museum of the Parish Church of San Giuliano, the Church of Gesù and the Church and Monastery of Santa Chiara are also found on the square. The Collegiate Church of San Giuliano: construction work began in 1840. The church was consecrated in 1853. The portico was not built until 1867, followed in 1930 by the bell tower, based on a design by the architect Corinto Corinti (Castiglion Fiorentino 1841-Florence 1930). The façade of the new building has a pronaos with large columns resting on travertine bases. The interior layout is a Latin cross divided into three aisles covered by a barrel vault and divided by six columns. In the transept chapels and those to the sides of the main altar are two life-size statues in stucco representing Saint Julian, the titular saint of the church, and Saint Michael, patron saint of Castiglion Fiorentino, both 19th-century works by the Zanazzo firm of Rome. The altars exhibit numerous works of art that predate the completion of the building and which come from demolished churches and others in the area. 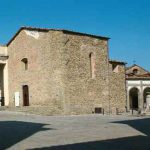 The building that houses the museum with its collections of sacred art from the surrounding area is essentially what remains of the ancient Parish Church of San Giuliano. The current building corresponds to the transept and part of the nave that was reduced following the 1840 construction of the collegiate church. The Parish Church of San Giuliano rose above the small 14th-century parish church of Sant’Angelo e San Giuliano that was demolished just before the mid-15th century and stood near the Church of Santa Maria Novella. Tradition has it that the parish church’s developer and main patron in 1432 was Ser Giovanni di Nanni del Giunta, a notary and rector of the Hospital of Santa Maria della Misericordia. Construction of the church began in 1452, with the work being completed in 1501, the same year it was elevated to the rank of collegiate church. The Parish Church of San Giuliano had a Latin-cross plan with a single aisle and three end chapels. Outside, a portico with five arches supported by Ionic columns ran along the side wall where the main door was found. The interior was characterized by a large arch with a stone balustrade that led into the central chapel dedicated to the Madonna, as evidenced by the placement on the main altar of Segna di Bonaventura’s Madonna, now in the new collegiate church. 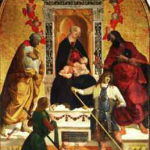 In 1486, the San Giuliano Altarpiece by Bartolomeo della Gatta was placed on the same altar. Madonnine agghindate, catalogo delle mostre (Anghiari 7 aprile-18 settembre 2005, Cortona 30 settembre-27 novembre 2005, Arezzo 7 dicembre 2005-26 marzo 2006), a cura di P. Refice, V. Conticelli, D. Gatta, Tipolitografia Petruzzi, Città di Castello, 2005. Arte in Valdichiana dal XIII al XVIII secolo, catalogo della mostra (Cortona, Fortezza del Girifalco 9 agosto-10 ottobre 1970), a cura di L. Bellosi, G. Cantelli, M. Lenzini Moriondo, Arti grafiche Alinari Baglioni, Firenze . 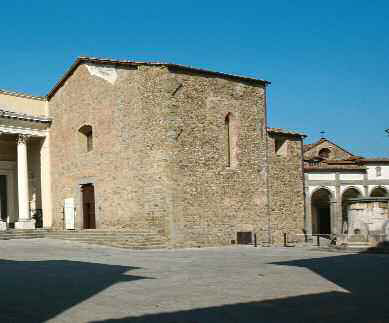 Museo della Pieve di San Giuliano, Collegiata di Castiglion Fiorentino: guida alla visita del museo ed alle sue opere, Provincia di Arezzo-Edifir, Arezzo-Firenze, 2009. Sub Tutela Matris, a cura di M. Donati, L. Coradini, S. Pieri, G. Romanelli, C. Cannelli, Litostampa Sant’Agnese, Arezzo, 1981. Mater Christi. Altissime testimonianze del culto della Vergine nel territorio aretino, catalogo delle mostre (Arezzo maggio-luglio 1996), a cura di A.M. Maetzke, Silvana editoriale, Cinisello Balsamo, 1996. Sacra Mirabilia. Tesori da Castiglion Fiorentino, catalogo della mostra (Roma, Museo nazionale di Castel Sant’Angelo 18 febbraio-11 aprile 2010), a cura di P. Torriti, Edifir, Firenze, 2010. Attorno a Piero della Francesca. La questione di San Giuliano, catalogo della mostra (Sansepolcro 20 novembre- 23 gennaio 2011), a cura di S.Magnani e P. Refice, «Rivista della Fondazione Piero della Francesca», III (2010), 1-2. La Collegiata di Castiglion Fiorentino, C. Serafini, Tip. Croce, Castiglion Fiorentino, 1993. Salvi Castellucci pittore aretino e allievo di Pietro da Cortona, L. Fornasari, Città di Castello, 1996. Bernardo Santini pittore in Arezzo, L. Fornasari, Omnia Grafica, Arezzo, 2000. Da Tanaquilla alla Tonacella, catalogo della mostra (Castiglion Fiorentino, Museo Archeologico 27 giugno-4 luglio 2004), a cura di M. Scalpellini, “Quaderni di Biblioteca” n. 23, Tip. Tanganelli, ed. Museo civico Archeologico, Castiglion Fiorentino, 2004. In the foreground the body of Jesus is resting on the lap of the Madonna in turn supported by another female figure. To the right the Magdalene kneels at the feet of Christ; next to her an elderly man is holding what could be the shroud. San Giovanni turns his eyes to heaven, while a woman wipes her tears. On the left side is a trio of two men and a woman with her hands clasped. The man without a beard is traditionally considered to be the client who commissioned the fresco. 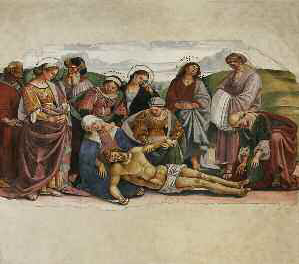 Unfortunately, nothing definite is known of the Lamentation’s original placement inside the church: Leonetto Tintori, who restored it in 1940, assumed that Signorelli had made it for the high altar of the same chapel, while Mancini (1903) says it was moved to the baptistery chapel by Filippo Berrettini in 1629. Certainly the fresco was cut and repainted. Various hypotheses with regard to its dating have also been put forth over time by scholars. It seems reasonable to accept those who have placed the fresco’s execution between the 1480s-1490s. Provenance: Church of Santo Stefano. The painting is set in a 17th-century stone altar. In the center of the broken entablature above is the Dragomanni coat-of-arms. All ancient sources, beginning with Vasari, cite this work as having been carried out by Lorenzo di Credi. 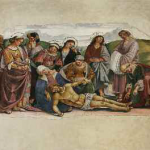 Considered by critics to be a late and minor work by the painter, the recent restoration instead has highlighted its pictorial quality, thus moving the date of its execution to the early 16th century, connecting it to the same subject in the Uffizi. The inscription on the frame reads QUEM GENUIT ADORAVIT. Entitled the Madonna Enthroned with Saints, this massive panel painting of great opulence and complexity was painted by Bartolomeo della Gatta in 1486 for the high altar of the old Parish Church of San Giuliano. It remained there until 1576 when it was moved to the Chapel of the Bells (delle Campane). Embedded in the chapel wall, it was plagued by a series of troubles and, as the historian Castiglione Ghizzi noted with bitterness, by ”our neglect of Castiglion Fiorentino’s past”. It was long housed in the now-destroyed Church of Santa Maria Novella where it was placed on the floor, serving as a platform for games. Sawed in two and then put back together again, it was finally placed at the third altar of the right aisle in the collegiate church built in the mid-19th century, where it may still be seen today. 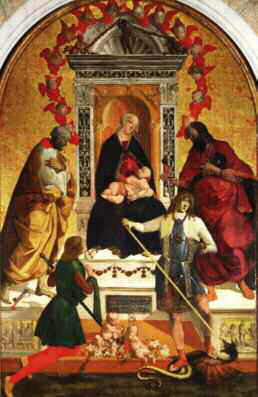 The composition is dominated by the throne of the Virgin, a figure of Botticellian elegance. The name of the buyer from Castiglion Fiorentino, Cristiano di Piero di Cecco “maniscalcho” (marshal), and the year “1486” are found on the base on a painted plaque. (Inscription: CRISTIANO DI PIERODI CECCHO MANISCALCHO DA CASTIGLION RETINO, MCCCCLXXXVI). The altarpiece was completed by a predella whose four compartments told of Saint Julian’s earthly life. Two of the compartments were stolen from the sacristy in 1910, while the two remaining, the first and the fourth in the sequence, have recently been returned to the Museum of the Parish Church after having been stored for many years at the Arezzo Superintendency. The Father Tries to Kill His Infant Son: Julian’s father tries to kill the child in swaddling clothes as a wayfarer had prophesied that his son would kill his parents; the mother and the nurse, holding a spindle and distaff, rush to prevent the infanticide. On the right, Julian, now a boy, leaves his parent’s home to avoid fulfilling the prophecy. 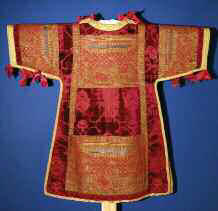 The tunicle, or dalmatic, was worn by the deacon and the subdeacon during solemn rites. What is surprising is to find such a precious artifact in this out-of-the-way church. Not knowing how it arrived in Petreto, only assumptions related mainly to the object’s exceptional nature can be made. It is clear that we have before us a rich and sophisticated commission that, due to a proximity of place and history, suggests that it was from Teodora, the daughter of Laurenzia and Paolino Visconti (died 1450), who had arrived as the wife of a Lambardi di Tuoro, whose castle was in the vicinity of Petreto. Red silk velvet was manufactured not only in Venice but also in Tuscany, in the cities of Lucca and Florence. 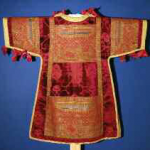 It has a pomegranate motif that, in the iconography of the Catholic Church, symbolizes at the same time eternal life as well as the Passion of Christ and his Resurrection. The small pomegranate, surrounded by corollas and jagged petals, is set within a polylobate leaf, again of Gothic style. The figured scene—in silk lampas with horizontally-woven gold thread—depicts the Nativity. It is surmounted by a canopy supported by four angels bearing the words VERBUM CARO FACTUM EST (“And the Word was made flesh”, John 1:14). Saint Julian Kneeling Before a Pilgrim Leper: the predella illustrates the atonement of the former knight who had founded a hospital for pilgrims. There, he takes in a leper, offering him his bed; the leper proves to be Christ who, recognizing Julian’s generosity, grants him eternal salvation. Museum of the Parish Church, exterior. By car: SS. 71 Umbro Casentinese. Autostrada del Sole A 1, exit Val di Chiana and Monte San Savino. By train: Florence-Rome railway line. Saturdays: from 10 a.m. to 12 noon and from 3.30 to 6.30 p.m.
Sundays: from 10 a.m. to 12 noon and from 3.30 to 6.30 p.m.
Other days by appointment: tel. 0575.658080.